I know, I know. It's been a seriously long space of time since I did a tutorial. I love tutorials and at one moment in time, I felt I had a lot to give in that arena. Thing is, things have been so busy. Something you've heard from me for a bit. The great part is though, I've got help now! Oh my gosh! You guys, you're going to start meeting some of my staff here and I'm going to coax them into writing a few bloggy blog posts. They are all so creative. Can I just say, its super fun being around creative sorts and its so much fun to see the light in their eyes when they talk sewing. Anyway, anyway today, as a finish to the week, I thought I would get back to a little tutorial writing. Today's topic is sewing and attaching a patch pocket. Lest you think this might be a yawn, I'm here to say that patch pockets can definitely turn a handmade project into homemade at a moment's notice. The kind where people are like, "Hmmm...did you make that?" And in their head they're like, "cuz it looks like it." Oh the shame, the shame! So let me give you some of my tips, eh? I'll be showing you how I attached the patch pocket to my pink jacket - the Kaisla (out of print), in case you're interested - which is the same method I used to attach the patch pocket to my green jacket and well, hopefully it all makes sense. Leave questions if in doubt. Step one - I'll assume you've cut out your pockets and are ready to go. Start with your lining. Trim about 1/8" off the sides and bottom. Step two - Pin the top edge of your pocket lining to your pocket, right sides together. Notice how each side edge of the lining is slightly smaller than the pocket (meaning the floral fabric is smaller than the pink fabric). We'll talk more about the why in just a sec, but that's what you want. 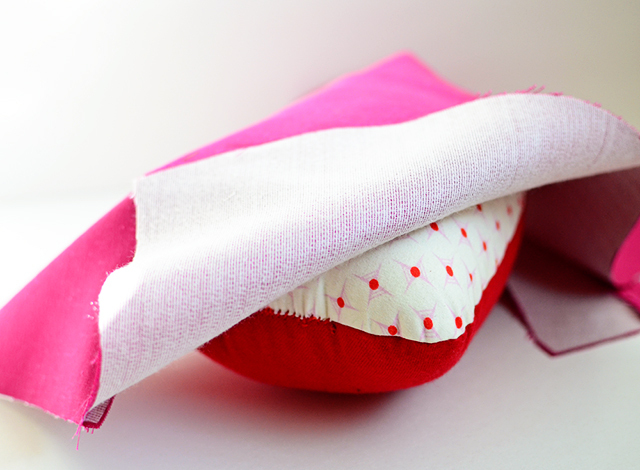 You'll be doing a bit of easing the pocket lining into the pocket. 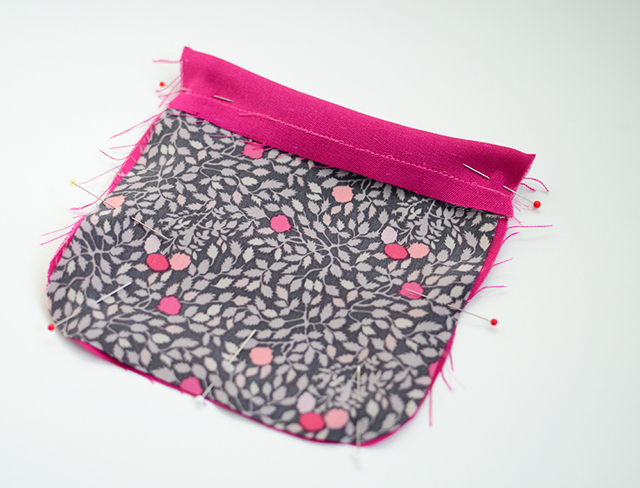 This means that the pocket will end up bubbling just a bit when you pin it together. Step three - Stitch the top edge together now. 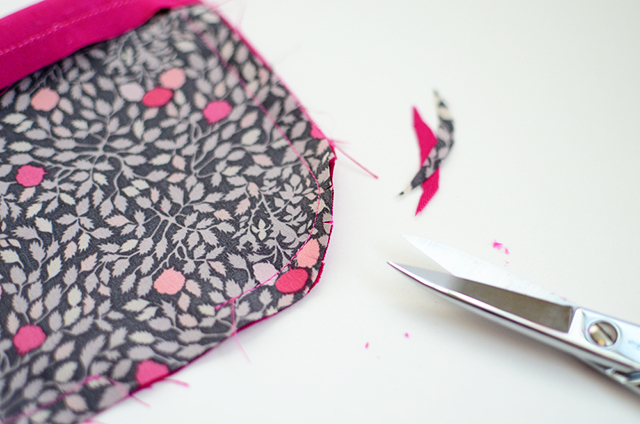 Here's a good rule of thumb when you have a bit of easing to do on a sewing project. Put the shorter side face up - facing you - and the longer side facing down in the bed of the machine. The feed dogs of a sewing machine will naturally feed the fabric faster than the foot and then you won't have to do too much work except guide the fabric through the machine. Step four - Stitch the sides and bottom of the lining to the pocket, right sides together. Again this will require a bit of easing. Leave an opening somewhere in there so you can turn the pocket. I usually leave mine in the bottom edge and its about 2 -3 inches wide. Step five - Trim down your edges if you need, clip your curves and turn your pocket right side out. For my favorite ways of getting sharp little points I use a bamboo point turner. 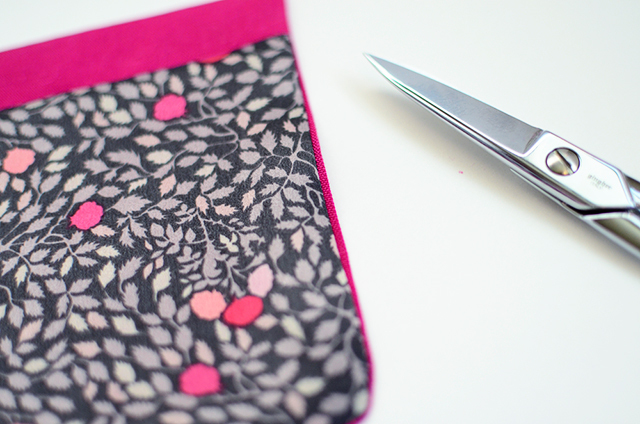 Step six - Now give your pocket a press and behold, you're lining will naturally favor the inner part of the pocket. Wanna talk favoring for a minute? Let's. 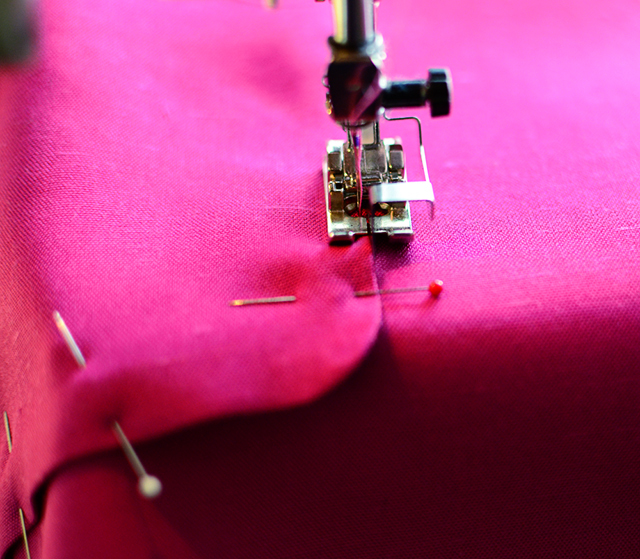 Favoring is when you have a seam and you want it to favor one side of the garment. It's the reason why you understitch, like for example on a waistband. 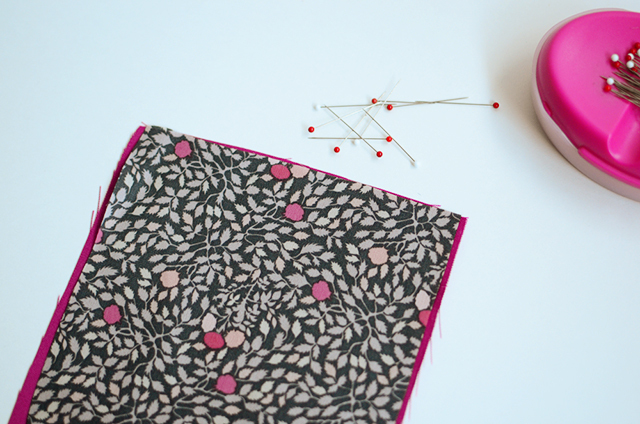 You understitch the faced section of the waistband so that it favors the inside of the garment. It's a finishing touch that is really nice. Now on a patch pocket, you want that same idea, but since you can't really understitch, you have to cut down your lining so that it ends up being a bit smaller than your pocket and it will favor the inside of the pocket. The thing of that is, you want this to happen because when it doesn't and you use a fun and cute little lining, you can see that lining peeking out from the pocket on all sides when you are wearing the jacket. It's not a good look. Trust me. Been there, done that. I have a t-shirt. Step seven - Now its time to attach the pocket to the jacket. Because you're not a square or a rectangle, but because human bodies have curves, you want your pocket to have a certain puff when it is attached to the jacket. This way, when you wear your jacket or skirt or what have you, the pocket is not pulling or distorting the piece its attached to in a rather unattractive way - which by the way, gives your handmade garment the wrong kind of attention. To get the desired look, pin your pocket to the garment section when its laid on a tailor's ham - or something else that mimics curves. Step eight - Stitch your pocket to the garment with an edgestitching foot. This is my favorite foot of all time. Oh my gosh - I could marry this thing. I love it so! A most prized possession. It gets so close to that edge and looks so professional. Now, don't forget that you'll want to give your pocket a little triangle up at the top sides as your attaching. Meaning you'll stitch a triangle shape in that area. It will end up giving the pocket more strength especially as hands and such get shoved in and out of it. Et voila. Finis! I have to say that I'm a serious, serious patch pocket lover. A good patch pocket is just sooooo charming. Like, so charming. They add just the right touch to a garment. Don't you think? What do you say to patch pockets? Ever tried some of these techniques before? PS ~ Happy V-day! 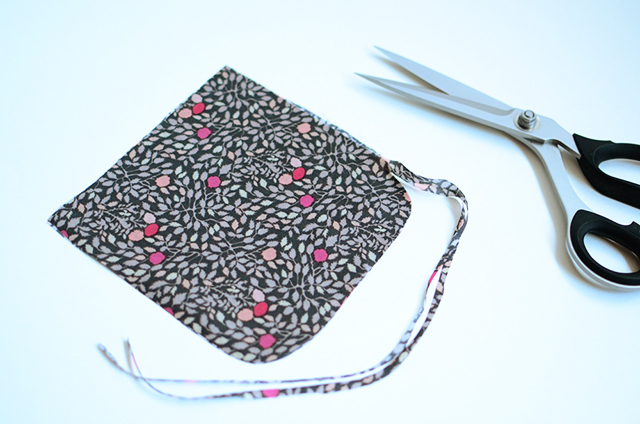 A little sewing tutorial gift from me to you! I literally attached patch pockets to a blazer yesterday :P Ah well, it's a wearable muslin, so I'll use your methods for the "real" blazer (which is also pink!) when I get around to it. Thanks for a great tutorial! Thanks Sunni! A lovely pink tutorial for Valentine's Day! This is awesome. It seems like something that would be so simple but it's actually kind of difficult to turn good patch pockets! 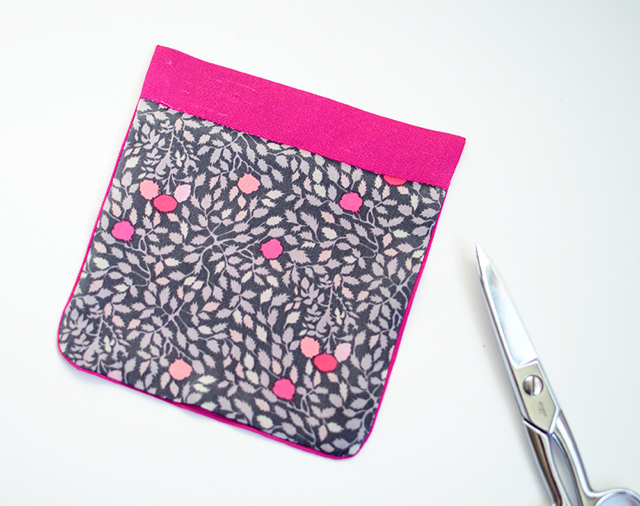 ugh, patch pockets have been a monster-in-the-closet to me, this tutorial could get me to try them again. i honestly didn't reconize your jacket pockets as patch, because they were so damn pretty! Patch pockets are usually not something I usually fall for either, as they do have a tendency to look so homemade. But I have to admit, I think you have made a believer out of me. 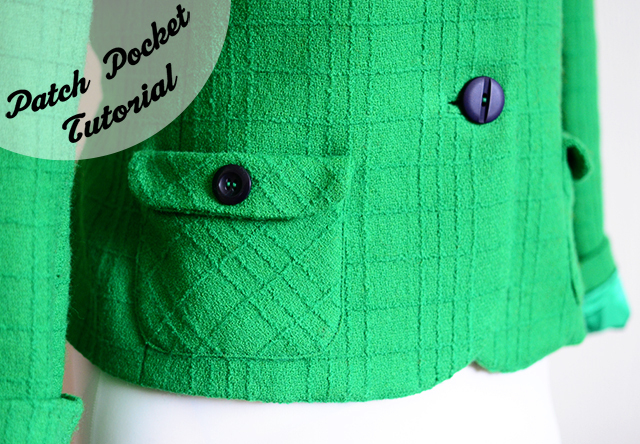 Great tutorial and some seriously stylish patch pockets! Who would have thought!! Thanks for this tutorial! I avoid patch pockets as well, they are just so easy to get wrong. Your pockets are so lovely, they make me want to give it a try! Great tutorial. I'm now trying to figure out what I can make with patch pockets! I really want to try this. Great tutorial! I once made a Burda coat that had you slipstitch the patch pockets on and then topstitch, which takes some more time but might be useful when you want your topstitching a bit further away from the edge! Doris! You just made my day! Thank you. Your sweet words mean so much! Thank you Beth! It's so good to hear that you're making a pink blazer - I'm seriously lovin mine. Can't wait to see your blazer! Pink forever! Thank you Alyssa! And Doris is such a dear! I agree. They are one of those things that seem like it should just be the easiest thing in the world and they aren't exactly. A well executed patch pocket rocks! Oh thanks Oona! Yes, I've had some really unfortunate patch pocket experiences. They can look soooooo bad, so fast! I love them on jackets and they can look killer on skirts and even shirts as well. Even like a Grainline Scout Tee and little patch pocket. So fun! I've done this too! I've also attached patch pockets soley by hand and they can look even nicer when done like that too. I might just have to do a part-two tutorial. that should be how did you make the flap on the pocket? I'm a huge patch pocket lover too. More than exposed zippers or ruffles! Quick question. When stitching the lining to the pocket at top, is it wrong or right sides together? I see that in the next steps, the top of the pocket is folded back and then folded under 1/4" (?) to clean finish? It might be me that's missing something - it's Friday and my brain is fried. The flap pattern piece came with the Kaisla jacket pattern and yes, I stitched the flap portion in a similar way except instead of using lining I used another piece of the same pink fabric for the flap facing. Since I wanted that favoring to happen though, I did cut the flap facing a little smaller than the outer flap. Hopefully this makes sense! 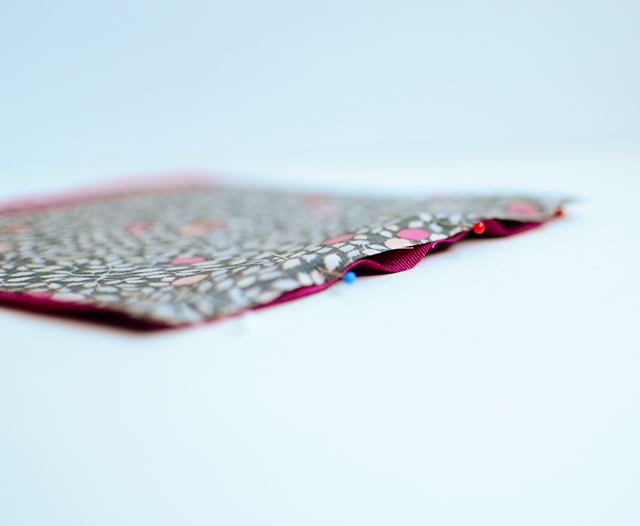 When stitching the lining to the pocket at the top edge of the lining, its right sides together. 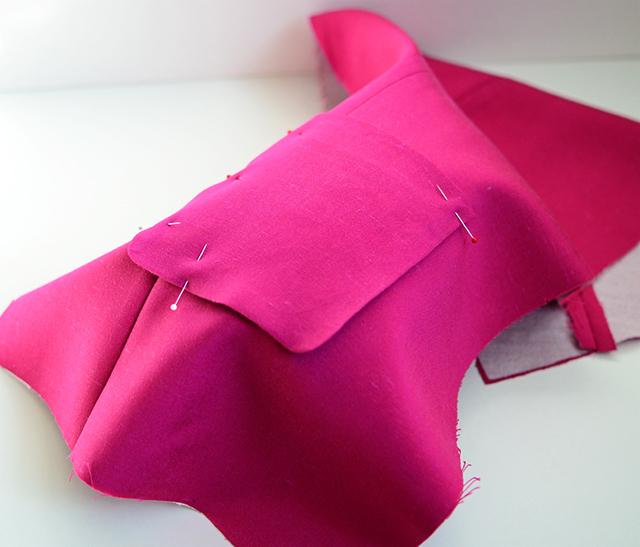 Then the top edge of the pocket (the pink fabric) folds back about 3/4" or so. No need to fold under again, which would kind of be impossible really. Its just a seam that connects the lining to the pocket at the top edge of the pocket lining. I did press the seam in one direction only (downward toward the lining), so maybe that's where the confusions lies? The lining piece is quite a bit shorter than the pocket so that you don't have to have too many seams everywhere. Just makes for a nicer finish. Ah, yes, I was looking at the image incorrectly. I apologize about that. Thank you for clarifying. Thank you for the great tutorial - such a small part of a garment, but it can have a major effect on how professional it looks. I love the "non-snip" method of turning corners. Light bulb moment when I tried that! Hi Sunni, I love reading your blog. You are such an inspiration. In the past, I have signed up to receive your blog via my email and for some reason the email notifications have stopped. I have gone back on your blog & re-entered my email address for blog updates, but alas nothing!!! I don't want to miss any of your blogs as they keep me inspired. Any ideas as to why I no longer receive the email notifications? Oh no! I don't really know what could be the problem (I'm not totally tech savvy). I am also signed up for the emails for my blog, just to make sure everything works, and it seems to work just fine for me. Are the posts being sent to your spam folder by chance? If you mean my junk folder, then no they're not. I will add your email address to my contacts list to see if that makes a difference. I thought maybe you might know what the problem is in case another follower had the same issue. Thanks. Brilliant, thank you! I'm planning a denim skirt with patch pockets so great timing. Hey Sunni, I think I solved the problem. Will know for sure after you post a new blog. I recently heard a tailor talk about construction methods, and he described his method of attaching a patch pocket - he folded under the seam allowances and somehow he managed to machine sew inside the pocket along the seam allowances. Sounded too fiddly to me, your method sounds easier and just as neat. A great tutorial Sunni, thanks. I bought a lace blazer once and the patch pockets gaped open; it was not a good look. I think they should have been smaller and had stiff interfacing. I posted this to facebook and Pinterest. Looking at this tutorial, I think attaching a patch pocket is HARD, but I hope it's easier when I actually do it. Thank you for the tutorial. Big help!